David (Dave) Charles has always loved working with his hands. Born in Southern California, Dave spent some time in Washington with the Navy. When he was through with his tour of duty, Dave was unable to find work in California and since he had married a woman from here, Priscilla, they decided to move to Thurston County. They have lived in Lacey for the past 16 years. When he was in high school, Dave studied various art forms. As an adult, he has had a variety of jobs, including two years silversmithing. Other jobs have included being a carpenter, a rigger at a shipyard and even a golf course superintendent at a small golf course where he constructed buildings, took down trees and fixed the plumbing. “I really have always worked with my hands,” he says. “I reached a point that I was going nuts not having enough to do,” he says. “I was used to working long hours and I had been a laborer all my life. My father said, ‘I have this small lathe, do you want it?’ And I said, ‘Sure, I’ll try anything.’ So he brought it up and showed me the basics.” That was the summer of 2005. 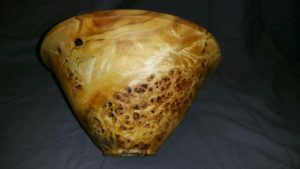 Since then, Dave has self-taught himself the amazing craft of woodturning. For his own craft, Dave specializes in making things out of pieces of wood that others have discarded. “People give me pieces of wood that they don’t know what to do with and I make things out of them,” he says. “Like a sliver of wood that they can’t use, or maybe a piece that has some rot in it.” To use these pieces, he sometimes has to fix the rot while it’s turning. He does this by gluing shavings and sometimes coffee grounds with super glue into the wood as he turns the piece. He can make just about anything, and he does. From simple bowls and plates to goblets and Christmas ornaments. 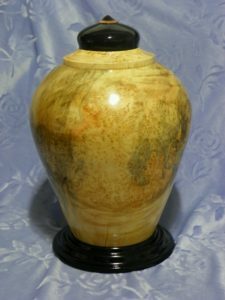 He also makes funerary urns. His wife has an amazing lighthouse he made for her. He has made birdhouses and even a hot air balloon (another one of his wife’s favorites). 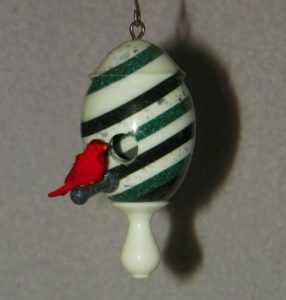 He also plays with turning Corian and has made ornaments, belles and spinning tops with it. A fun part of Dave’s work is the history he is able to preserve. He often gets a piece of wood from a very old tree that he then gets to make into something that will last for generations. He just recently made some items out of a butternut tree that was brought into the state – it was certified as being around 125 years old. “On occasion the state will contact the Woodturners of Olympia (WoO) saying either they have a tree down or they are taking down a tree and they ask us if we would like some of the wood,” says Dave. Some of the members of WoO then make gavels out of the wood, to give back to the state. The state then gives them to judges to use. “We’ve probably made 30 to 50 gavels over the years,” he adds. Another fun piece he made came from a piece of black walnut that was rejected by the Winchester factory back east because the grain was wrong. The piece was given to the pattern maker, who held onto to it for 30 years. He then moved from New York to California, taking the wood with him. When he retired, he gave it to Dave’s father, who let it sit for another five years before he sent it to Dave. While it wouldn’t work for a gun, it made a beautiful bowl. 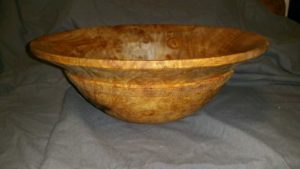 As a woodturner, Dave joined the Woodturners of Olympia. 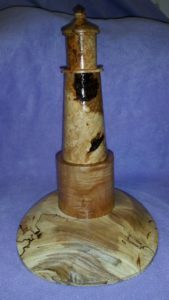 The Woodturners of Olympia’s mission is to educate members on woodturning and foster a wider understanding among the public about the traditional and contemporary art and craft of woodturning. The roughly 110 member club does monthly demonstrations, as well as demonstrations at fairs and events, including the Washington State Fair. There, they make tops for kids. They make them right there and give them away for free. In addition, the members of WoO volunteer at Olympia High School. Dave loves passing along his knowledge and passion to a new generation of craftsmen. They started out with just one class five years ago, and now they four classes at the high school. Now classes are almost 50 percent young women and they are very talented. 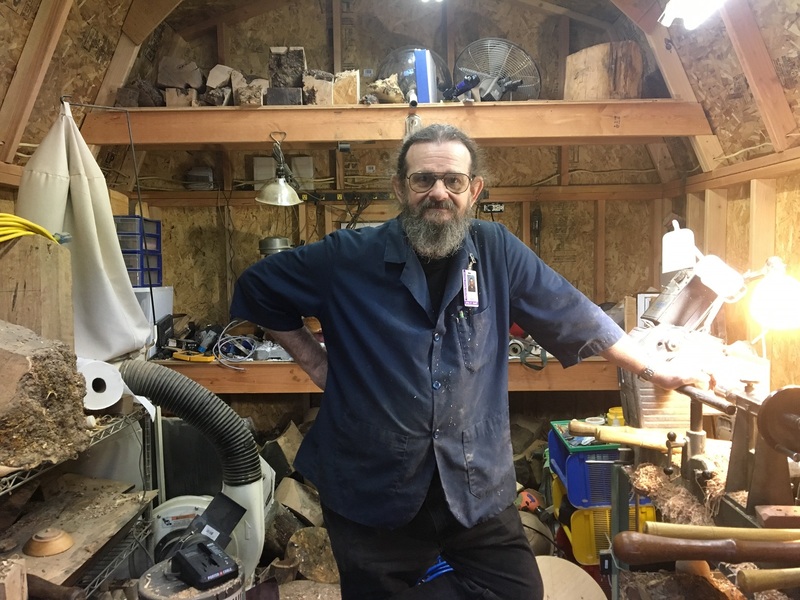 “I love the fact that I have a number of students who really have an interest in wood working and they want to learn, they aren’t there just to fill their time,” he says. He says several of the girls are very talented and have even been in the class for multiple years. Dave is glad to see young people taking an interest in the craft, since it almost died out in the 1970s. And of course for him, volunteering helps him keep his hands busy, which he loves.